Suggested by Anonymous Rimuru Tempest is a pretty tough being whose strength and speed are almost off the charts. I actually think he’ll give Mega Man a reasonable run for his money. 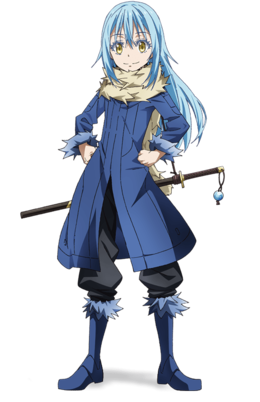 The fact that Rimuru has regeneration also helps his case as well. Still, Mega Man has proven himself time and time again to be incredibly durable. I think coupled with his large array of skills and physical abilities, Mega Man should still have the edge in this fight. Mega Man wins. Suggested by Sonic Mega Man has dozens of different special powers that he has accumulated over the years. ROB has some nice lasers and other projectiles at his disposal, but he is completely outmatched in that regard. Mega Man was built to destroy robots like ROB. In comparison ROB has no real experience fighting other super powered fighters and won’t last for very long in the ring. Mega Man wins. Suggested by Sonic Pichu is incredibly fast and also has a good amount of attack power. This fight won’t be as one sided as you may initially suspect. That being said, I think Mega Man ultimately still has all of the key advantages in this fight. He has more raw power than Pichu and his speed is comparable to the Pokemon’s if not greater. 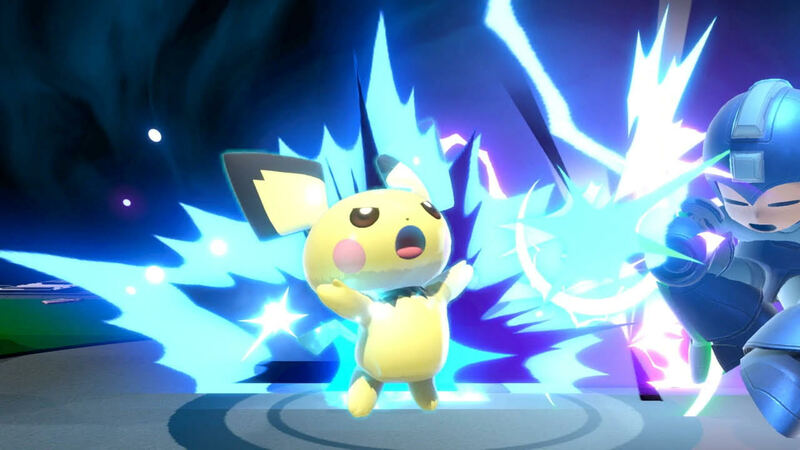 Throw in his 100+ Robot Master abilities and he really has too many abilities for Pichu to counter. Mega Man wins. It’s time to look at the one shot manga that was created to hype up the game. This one’s a little longer than the last one shot I reviewed as it’s around 20 pages. That’s a good thing since it allows for a fight and that’s one of the reasons why this artist has always been so solid. 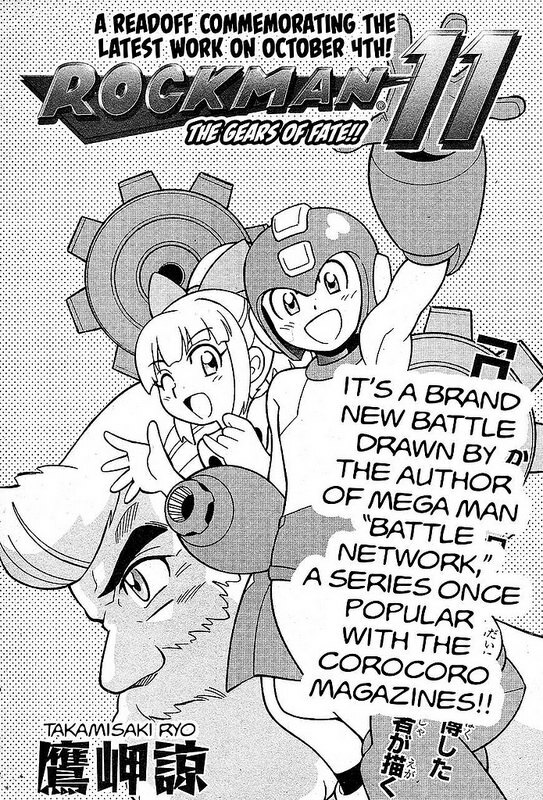 It’s nice to see Mega Man back in manga and it would be awesome if he could get a full length series again at some point. The character has had a great track record so far and I have no doubt that a sequel would fare just as well. The story starts with Wily wrecking havoc on the world once more. This time his robots have been equipped with the Double Gear system so even Mega Man is basically helpless to stop them. Fortunately Dr. Light has one as well so he gives it to Mega Man. Still, he warns the robot that if he ever uses both gears at once he will probably die. Mega Man agrees not to use it unless necessary and hops into battle. He’ll have to go through Fuse Man though and this may be his most dangerous task yet. The author perfectly gets across how serious of a threat this is. Since robots run the world in the future every time they turn evil it is a catastrophe. No matter how many times this may occur, there isn’t much that the humans can do since their whole economy depends on them. Fuse Man in particular is difficult to stop since he controls all electricity in the area and can turn it all off on a whim. The only way to stop his ability is to destroy him which also forces Mega Man to make some tough choices. At his core Mega Man is always a hero though and so he does what he can to find a better way. The battle between Mega Man and Fuse Man is top notch as you would expect from this artist after the brilliant Megaman NT Warrior series. He does a good job of showing off Mega Man’s speed and then also keeping Fuse Man at a higher level. He did have to rush the ending a bit as Mega Man never quite gets past the speed advantage but secures the win anyway though. I assume that had he been given more time then the fight would have been even more satisfying. Still, the art was fantastic and the action was amazing. This manga already has a more interesting environment and atmosphere then the rest of the Mega Man series. Imagine if Mega Man 11 actually played out like this. Full disclaimer, I think Mega Man 11 looks like a lot of fun so no shots at it, but imagine it in the art style of something like Sonic Forces. 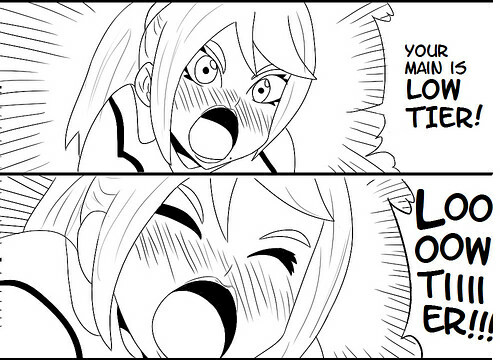 That’s basically what this manga looks like and it works pretty well. 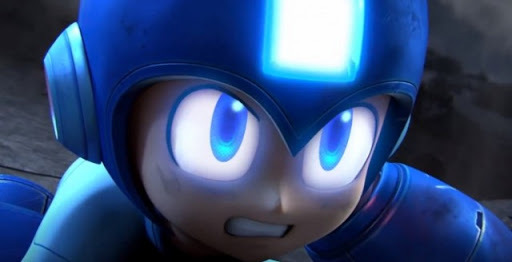 I’d love to see a third person shooter for Mega Man at some point or even a beat em up. The lore of the universe would work pretty well around that, especially if we get a proper robot invasion kind of story. Overall, Mega Man 11 is definitely a real page turner. The pacing is almost too good since the story ends so quickly and you are left wanting more. Hopefully the fan response to both the manga and the game is positive enough where the franchise gets completely revived and we see a whole lot of extra material. That would just be a lot of fun. If you haven’t checked this manga out yet then you definitely need to do so. It really shows you why Mega Man is still considered to be one of the most likable of the original video game icons and his character has stayed consistent through the years. 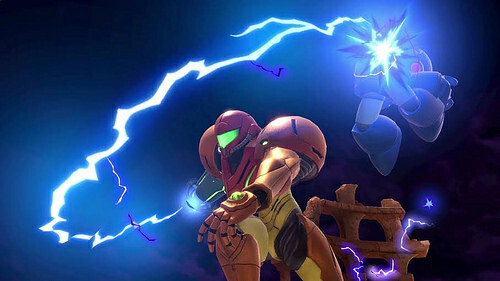 Suggested by Sonic Samus is a strong fighter and certainly one of Nintendo’s most powerful protagonists. Her speed is at a high level and her Zero Laser is likely more powerful than any of Mega Man’s attacks. 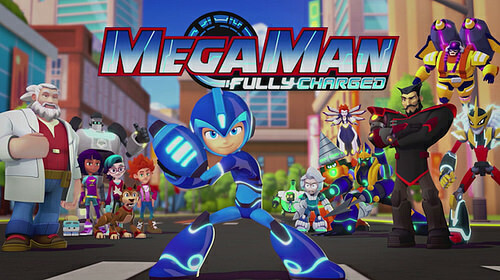 Mega Man does still have the edge physically though as we’ve seen what he is capable of in titles like Gigamix. He has more defense than Samus and what he lacks in martial art skills he makes up for in his large arsenal of abilities. Samus won’t be able to get past his skills and experience. Mega Man wins. 5 Reasons why I won’t main a low tier in Super Smash for Switch. So the next Smash Bros game is coming out soon and you’re wondering who to main. I don’t blame you, this is the kind of decision that is super important and will come back to bite you if you aren’t careful.I’m going to impart some wisdom to you here on not only why I won’t main a low tier, but why you shouldn’t either. 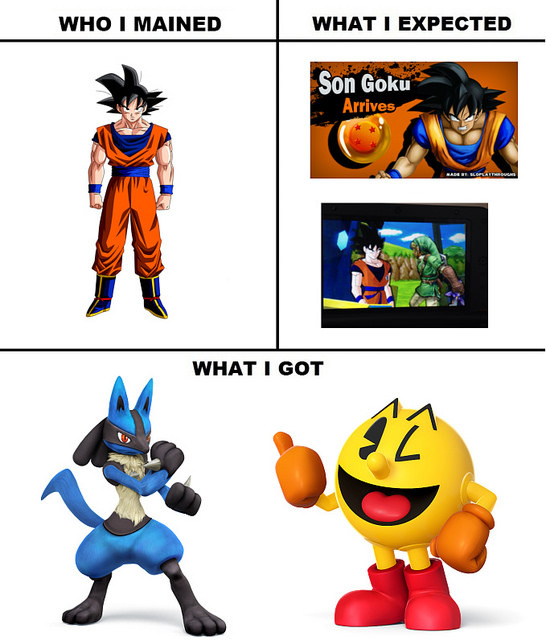 I mained Fox in the first 3 iterations of Smash Bros and upgraded to Bayonetta for Sm4sh. For Sm5sh I fully expect to be maining a top tier fighter as well. You need to choose quickly because otherwise you will become stuck. For example, if you approach most players who main a low tier they will deny it. You can yell it as loudly as the character in the picture above but they can no longer recognize that their character is low tier. You simply lose sight of the character’s faults and that’s why you need to make the right choice the first time around. 1. You have to develop your own Metagame. When you pick a top tier like Diddy Kong or Bayonetta you’re in for a fun time since you can just toss out the same old combos that you see the top players pulling off. For Bayonetta just keep using her witch twists until it gets the KO. It’s an extremely safe attack so don’t worry about getting punished for it. See, the thing with low tiers is that everybody is always eager for someone else to main them, but nobody wants to do it personally. That’s because you are the guinea pig here. They want you to learn the combos so they can just steal it along with the character once you prove that they can be viable. Of course, that’s hardly a guarantee in the first place. Odds are that you’ll be doomed. Worst case you think you are picking a great character as seen in the picture above, but then the reality is a little different. If you lose to someone when you’re playing one of the best characters then you can easily make an excuse like you didn’t sleep well or something and people might believe it. After all, how else could you lose to a low tier? However, if you lose to someone while playing a bottom 5 character then you only have yourself to blame for picking the character. At least that’s going to be the counter argument and it will be a very tough one to get around. How do you debunk such a statement? It gets tricky and this actually leads into my 3rd reason. Whether you are second in your pool, in the tourney, or in your half of the pool, there will always be a ceiling that you can’t shatter. 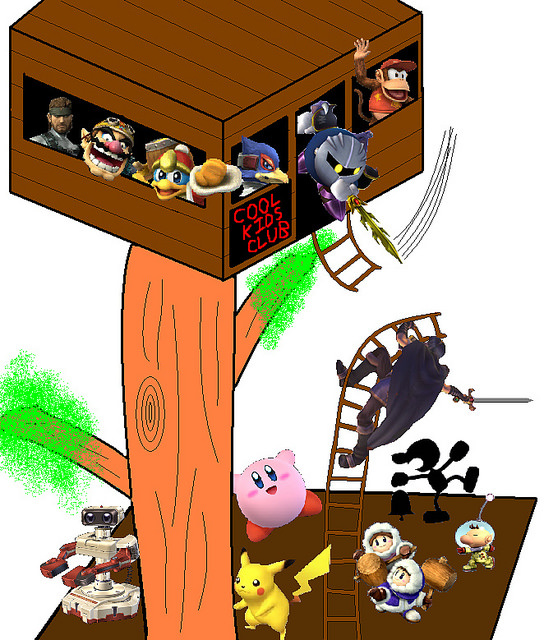 After all, when was the last time someone saw Buff The Puff win a big tourney or Melee Kirby doing anything? You’ll ultimately never get to see most of the prize money for the Smash tournaments and that will turn the game into a very expensive hobby. If you can’t make money off of it then why continue to spend money to enter the tournament? It just doesn’t make any sense. Character loyalty will only hold you back in bracket. Better to be just another Bayo than to be known as the Zelda guy who is always stuck at pools. 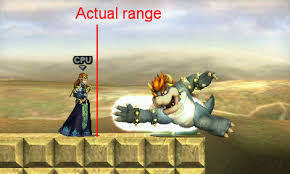 If you don’t know any better you’d think you were out of the range of another character’s attack like in this picture, but hitboxes can be very deceiving. 4. You won’t get Top Player privilege. Prepare to be treated like everyone else. Overslept through a pool and want the TOs to give you mercy? Not unless you’re a top player and last I checked, to be a top player you can’t use a low tier. It’s a tough predicament, but one that you will ultimately have to live with. A loop hole that you could use for any of the reasons on the list is to pick a top tier and just call him/her a low tier. Some top players have attempted this and while most will smirk you can probably trick a few into thinking this. Top character privelege is a thing as well. Top tier characters have a lot of cheesy gimmicks and techniques to break their fall so the player can afford to get outplayed the entire set and still win anyway. 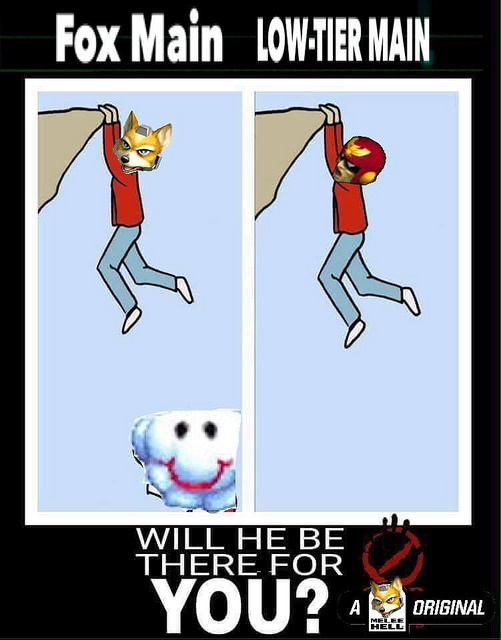 If you main a low tier then there is nobody to save you from the fall. This may sound contradictory but it’s true. Low tiers thrive on match up inexperience and gimmicks. Most of them are really one trick ponies. At first they will terrify the opponent but then they realize that their attacks actually aren’t so dangerous. Zelda has her down throw to up air, but that’s it. Ganondorf has his powerful attacks, but will get combo’d to death way before that. 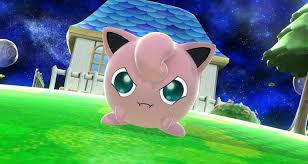 Buff the Puff dies against anyone with range, etc. Once your opponents figure out what you are doing then it is over. Unfortunately for you, they will inevitably figure it out since this will become obvious the more you play them. You want to play a character who is really OP so even once they know what you are doing it won’t matter. I say all of this to help you enjoy the game more. You may think that as long as you enjoy a character that you will be fine, but this isn’t usually the case. After all, if you are still losing a lot then that will take away the joy. You can play a boring character all day meanwhile but if it delivers the wins then you won’t mind so much. Of course it will be tough to tell who the top tiers for Smash 5 are right away (Assuming it’s not a port although I have my doubts) but just listen to the general consensus and stick with it for a while. Listen to the Twitch chat or the Reddit professionals and just copy their ideas. It will help you win a lot of tournaments before everyone has picked up the pieces. This was a relatively short editorial, but one that I felt was necessary to release before the game came out. Pick a main wisely as you won’t be able to switch right away without the world taking notice. I’m always up for a good robot game. Mega Man and Custom Robo were always exceptional titles and so naturally LBX looked like a winner from the get go. I actually got to watch the TV show way before the game so if anything this version feels pretty nostalgic while playing through. The anime adapted the game pretty faithfully to be honest and the quality is sharp since it’s by Level 5. Those guys really do a great job of completely building a game around its concept. Layton is the perfect puzzle game and this is the optimal robot experience. You just can’t go wrong with buying this title. The story follows a kid named Van. He’s really interested in the new game that everyone is playing. It’s called LBX and you buy a mini robot that you can use to fight with other people. Think of it like those classic Rock em Sock Em toys that used to be around, but 1000X cooler as the robots have weapons with live ammo and you control them with your phones. Unfortunately his Mom is against it for reasons unknown and Van’s Dad may have created the LBX franchise, but he died in a plane crash. A mysterious lady gives Van a one of a kind LBX one day though and after he stops some burglars from stealing it, he ends up joining a private faction who is trying to stop the villain organization from using it for their own means. They tell Van that his Dad is actually alive and being held hostage so Van quickly goes on board. His two friends Ami and Kaz agree to help as well. They’ll have to win multiple tournaments, break into enemy territory, and hone their skills. The risk is high, but there are lives on the line so the heroes put on their game faces and get ready for action. It’s a pretty long game at 15 hours so that’s really just the tip of the iceberg when it comes to the plot. There are 12-13 episodes in the game and the length varies for each one. There is also a lot of replay value as you have many parts to buy and quests to complete. I did a few quests here and there and got a bunch of weapons, but getting them all would take a long while. There are also online battles that you can play so content is certainly not lacking in this title. You can have fun playing the game for a very long time and it’s worth the full price. The soundtrack is stellar. It was pretty cool hearing the tunes from the anime even if they technically came out in this game first. It was still nostalgic and most of them are quite memorable. LBX spared no expense in this department and the same goes for the graphics. Not only are the in game graphics sharp, but there are a number of fully animated cutscenes at the ready as well. They really help you dive into the game. It used up a bunch of these cutscenes early on and I would have preferred for Jin to get more of them, but it’s how it goes. It’s really impressive that they added so much in and I feel like we got more animations than Layton. It just feels that way so I can’t confirm it, but a quick Youtube search would give you the answer to that. As you can imagine, the gameplay is really sharp. It’s in full 3D like Custom Robo and you can equip two weapons at a time. I always went with a good Machine Gun and an electric sword. Even if it’s not the strongest, I like the electric sword because it stuns the opponent so you get more hits in. More hits = More damage or at least that’s how I saw it. The gun can be safer, but the opponent can use the downtime between rounds to get in close and take you down. You have to use a lot of strategy here. You can carry health items to help yourself out as well. There are also a number of final smashes that you can equip. You can use a weaker one to try and get some damage in, but the catch is that the enemy might dodge it. You can instead use an ultra attack which is impossible to dodge, but you can’t move for around 5-8 seconds which is a long time and if an opponent deals enough damage during that time you will lose the attack. I was able to use it successfully in the final boss which was helpful. It seems to always happen that the boss gets me to my last bit of health and then I clutch it out. It’s an amazing feeling, but also super stressful. The final bosses were definitely incredibly powerful so I recommend training a lot so you’re prepared for it. I still think the concept of LBX was borrowed heavily from Megaman Battle Network, but it certainly did a good job of making a name for itself. It had a lot of its own unique features which differentiated itself from Megaman. It’s also a good move to be like Megaman since Capcom isn’t making any new games at the moment so we can get our Megaman fix this way. Imagine a Megaman game that was 3D like this one with a bunch of hype cutscenes. Hopefully Capcom can learn a thing or two from this title and incorporate it into future titles. The cast is basically the same from the anime, but I’ll briefly mention some of the big ones. Van is a solid hero as you’d expect. He’s always ready for a fight and is very proactive in trying to save his Dad. He has a brief lapse in confidence, but gets over it right away. At times he can almost seem too happy like when they arrive to the toy store to buy things which felt like a contrast to his rather serious self, but at the end of the day he’s still just a kid. It’s hard to say if he beats Lan Hikari or not as they’re both very similar. He’s a lead you can get behind. His two friends aren’t bad. Kaz is always low on confidence which can be a little grating, but he still helps out when he can. Ami is always supporting Van and doing her best to get in on the action. The school friends are pretty bland and underwhelming though. I can see why they got such tiny roles in the game since they didn’t add anything to the dynamic. Jin is a great rival and his LBX has an excellent design. He’s pretty reasonable throughout and does a good job of balancing this while still acting really confident the whole time. He’s an ideal rival and his team up fights with Van at the end are a blast. Dak and Gouda are two other characters who help out a bit. They’re a step below Jin and Van when it comes to ability, but the more allies the better right? I thought Dak was an enjoyable supporting character, but Gouda is a little too weak to be taken seriously. He was good as an opening boss though. Mr. Kaido is a solid main villain. The fact that he can actually fight goes a long way since he doesn’t have to hide when the fighting starts. His robot is also really cool and has a great design. One villain that came in towards the very end was Kirito and he was exceptionally good. Taking out almost the whole cast on his own was certainly a hype moment and the fact that his LBX had a Super Form was really cool as well. I have to say that I liked how the super forms were incorporated in this game. When you get below 25% health you can activate it and heavily boost your attack power. It helped a lot in the final boss and just looked really cool. When an opponent would use it, it would up the stakes as you had to focus on defense a lot more. Since some fights would give them all of their health back, the game really didn’t hold anything back. You need to be pretty good at the game and be at a high level to win. It always feels fair and balanced with just the right amount of difficulty to make things interesting. Van’s Dad is okay at best here. I still think he tends to run off too often and leave Van behind for no reason. He gets a lot of hype so he’s a good scientist, but seems like a bad father. I wasn’t impressed with the Red Haired guy and his Team Rocket homage members. They’re the only part of the cast/plot that I couldn’t take seriously. I just never liked them for some reason. The true final boss of the game was great though. His origin story was definitely pretty intense and his LBX even more so. It was a pretty nice/explosive way to end the game. It’s great to see Level 5 get to go all out with the ending here as most of their other titles are a lot more down to Earth. Now we know what they can do with a good action title. I didn’t even totally get how the final boss worked and just had to keep on buying time and using hit and run tactics. You can probably see why I just barely defeated him. 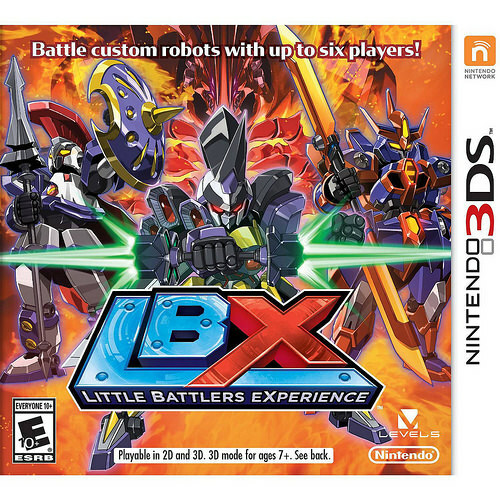 Overall, LBX is without a doubt an excellent game. There are absolutely no negatives with it. The gameplay was completely on point. It felt balanced and it was easy to lock on to an opponent. The levels were huge which was a lot of fun but you can move fast so you don’t have to worry about matches dragging out. The plot was really engaging and kept you alert with all of its twists and turns. You felt like you were playing a big RPG and I think this probably would fit in the genre considering that you do have to backtrack to various areas and you explore as you go through the game. The cast of characters was a lot of fun. It’s a little hard to get used to the American names so in this review I mainly used the ones I was familiar with but not all of them were downgrades. The main case where the English name definitely loses is with Justin though. The graphics and audio were definitely well above average and there is a lot of content in this game. It’s the definition of a AAA title and I’m convinced that Level 5 is one of the best studios of all time. It’s hard to see them churning out a game that isn’t great at this point. I highly recommend buying this game. You’ll be glad that you did. It’s time to take a look at the controversial Mega Man homage game. This is also game number 2 from the Christmas batch. It’s definitely a very solid game when we look at pure gameplay, but it could definitely use some work in other aspects. The main culprit here is the level design as some just don’t make a whole lot of sense and are pretty unfair. The game has a habit of not telling you anything either, but I’ll take some very slight blame on that since I guess I could have experimented with the controls a little more. Given that the price crashed so quickly though, it is definitely worth purchasing. The game follows Beck, The Mighty number 9, one of the last robots who is currently not corrupted. His fellow Mighty numbers have also started running amok and are causing terror in the streets. Doctor Sanda and Doctor White instruct Beck to save the day by defeating the robots and clensing them of the violent bug. It’ll be tough, but Beck is the strongest robot ever created so he should have the edge here. Who is controlling these robots though? Doctor Blackwell is a suspect since he has had many iffy crime dealings in the past, but he is currently in prison. With only one other actual character in the game, that means that we have 2 suspects. Well, lets start taking back the city! Beck’s a decent lead although it’s hard to say what his personality is. He seems kind of sassy during some brief points, but for most of the game he is basically Mega Man when it comes to personality. He doesn’t like fighting and he’s super heroic to the point where you have to wonder if he’s faking it. He’s a good guy, but there just wasn’t much to him and you would barely even guess that he doesn’t like fighting if Call didn’t mention it a few times. Call is basically the Roll of this game. She gets one level to herself, which is cool since you get to fight as her, but she is given a terrible moveset. Her blasters deal next to 0 damage and she can’t power slide so you have to crawl the old fashioned way. Her level was also one of the very bad ones when it comes to design. She was a good main heroine though and I am glad that she isn’t reluctant to fighting. All 3 of the doctors are fairly bland. Blackwell is easily the best of the three. He was framed and arrested so maybe the guy isn’t all that bad, but Doctor White certainly doesn’t like him. The game seems to be setting White up to be the villain of a sequel, which would certainly be interesting. White is even hiding the fact that he is related to Blackwell by changing his last name. Blackwell doesn’t like robots, which seems to be how the game is leaning him towards the dark side, but he doesn’t seem like a bad guy yet. The sinister design is probably an indication that he will do something drastic at some point, but he’s certainly no Wily yet. Sanda is the comic relief guy who constantly panics and stutters throughout the whole game. He definitely won’t be turning evil, but I wouldn’t want to see too much more of him. He doesn’t really serve any purpose in the story and is just there to be there. The Mighty Numbers are fairly decent. They all have different personalities and none of them appear to be all that bad. They’re like the classic robot masters, but the game did a good job of not making them too identical. There is an obvious Proto Man homage, but we definitely did need a rival in the game. All good franchises develop one at some point. He was easily the best one in the game of course. Trinity was also pretty cool though and she is easily one of the stronger bots. I’d expect her to play a major role in the sequel unless they nerf her for some reason. Now that would be a shame. As I got the PS4 version, it came with the free Ray expansion pack. I’ll definitely play that at some point, but for now that’ll go on the backburner. The character definitely looks cool though and I expect that he’d be a really good antagonist or rival figure. When I play that mode, I’ll upload an update post so that I can discuss it properly. I need to do the same with Shovel Knight at some point although this game certainly feels a little quicker so it would be higher on the list. Lets talk about the gameplay. 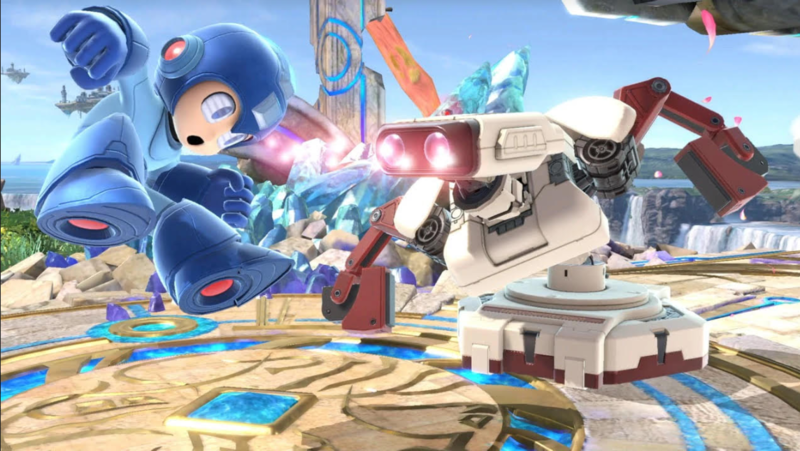 The positives are that they worked with the classic Mega Man style and improved it in some ways. Being able to air dodge is a lot of fun. It can be a little sensitive, but nothing too crazy. You may only slip and die a handful of times. I also like how strong the normal Mega Buster is. You’ll rarely want to use anything else, although the missile is certainly a very handy backup weapon. One thing you should know is that pressing on the PS4 touchscreen will let you use a health pack that you may have obtained during the level. If you see a blue icon under your health bar, then that’s what it means. You’ll lose them when you lose a life so use them before you die. I didn’t know about this until I was at the final boss. If I had only known earlier, I could have beaten the game way sooner and the final boss wouldn’t have been so difficult. The game never really mentioned anything about it though and I wasn’t going to surf the tips section until I found something. Again, I won’t blame the game too much, but this was a fairly important detail. You can also do back jumps while shooting by hitting the R2 button and that’s also very useful for the final boss. It only has niche uses though so you won’t be using it all that much. One area where the gameplay failed is switching between weapons. Why wouldn’t they leave it simple like in the Mega Man games by just hitting L1 and R1 to instantly switch? Instead, that allows you to cycle through and then you have to activate the switch with triangle. It’s too many steps and will likely cause you to get hit once or twice during a boss fight. I also have to take a shot at the level designs. Purple spikes KO you instantly, but some levels have a Mario Maker esque moment where you’ll fall down and just bump into them. There’s no way to know that they’re there so you’ll always lose a life the first time that you encounter this. As the game is pretty short, there aren’t too many of these moments, but the ones that are there will certainly get on your nerves. Some segments have various jumps around the purple spikes and one death can send you pretty far back. Some of the checkpoints simply weren’t placed well. The graphics are definitely pretty sharp and this is how retro inspired games should look if you ask me. It has the retro side scroller feel to it, but you can still see the updated graphics through the character designs and level layouts. Everything looks pretty smooth and modern, especially the aerial boosts. The game definitely looks quite good and that also helps get you into the game. The actual plot may have been somewhat underwhelming and the graphics never looked good for the cutscenes for some reason, but the actual gameplay visuals were always on point. The soundtrack is also pretty solid. Some of the themes are rather generic, but they are generic futuristic themes, which is still a win for me. The themes go very well with the moderate to fast paced gameplay. There were no “bad” themes in the game, which is always good as well. There is a good amount of replay value to be found here. Getting that Platinum Trophy will take a very long time since the trophies are very hard. Can you imagine beating the whole game in 30 minutes or completing it on hard without any continues? Those two in particular sound crazy and there are a slew of others that will be just as hard. It would take dozens upon dozens of hours to do this unless there is some kind of save stalling technique that I’m not aware of. It’s certainly possible I suppose, but it would still take quite a while. Getting all S ranks on the normal levels will also be tricky and then you’ve got challenges and online leaderboards to worry about. It’s quite a lot of content so that’s a good thing considering that over 70000 people backed the game and that it got way more money than it ever needed. The controversies surrounding the game were certainly interesting to follow along back in the day. Overall, Mighty No. 9 is a solid game. 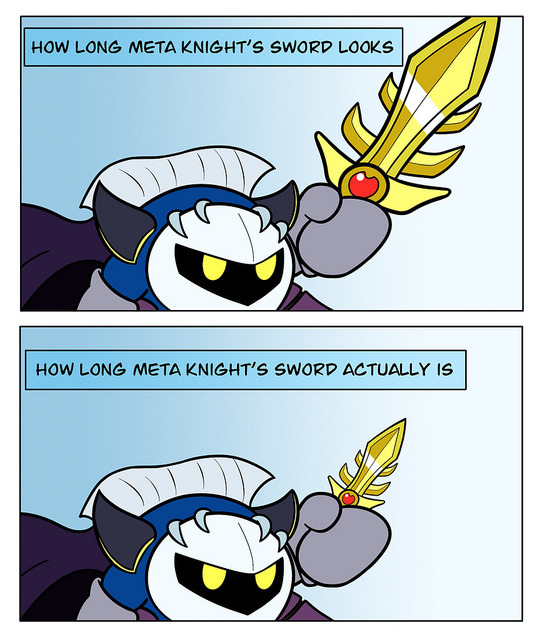 The level designs and the plot help to keep it from getting an 8 though. The main story won’t last you all that long either so if you’re not a big fan of the bonus content, then this game wouldn’t really be worth the 30 dollars for you. It currently goes for 10-15 though so that’s a very reasonable price if you ask me. This will also help alleviate the wait til the next Mega Man or Mega Man X game since it seems like it’ll be a very long time before Capcom gives us another one. I don’t get how a company can drop the ball so hard on one of their franchises, but that’s Cashcom for you. So, I definitely recommend this game and it was about what I expected, if not a little better. This is controversial, but I think it’s even better than Shovel Knight so that would make it my top indie game. It’s a little murky as to whether or not it counts anymore I suppose, but given that it was from kickstarter, I think we can still call it that. We’ll see if Shantae can take the crown though. 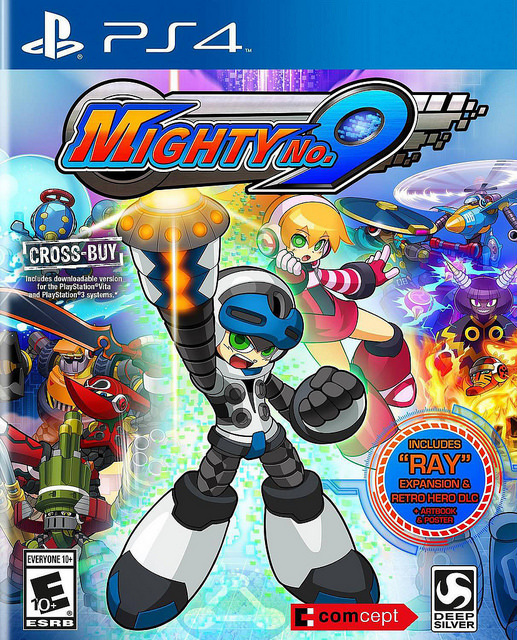 The gameplay is pretty sharp and the plot is much better, but Mighty No 9 does have some advantages like the soundtrack and the graphics. Only time will tell and that review shouldn’t be too far off either!